"We are committed to providing the best possible medical care to our patients and service to our clients. We will provide a modern facility and equipment and pledge to improve and expand our medical and surgical knowledge through continuing education. 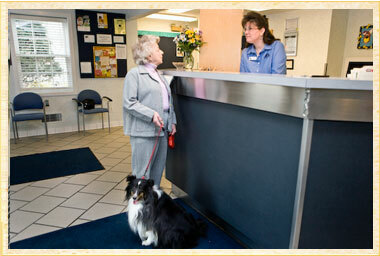 We will educate and communicate with our clients about their pets' health care. We will share in and support the decisions clients make when choosing the best course of treatment for their pets. We will conduct ourselves with integrity, empathy, and trust. We will treat our clients and coworkers with respect. We will take ownership of our responsibilities and will do everything we can to provide excellent customer service, improve patient care, and assist our coworkers in fulfilling our mission." Welcome to Rhinebeck Animal Hospital! For more than 30 years, Rhinebeck Animal Hospital has provided high-quality care for pets in the Hudson Valley. We utilize the latest veterinary technology, along with old-fashioned care and compassion, in order to provide the best veterinary care for your beloved pet. We have based our growth and reputation on our desire to find the correct answer in every case. The veterinarians and staff at Rhinebeck Animal Hospital spend an extensive amount of time researching, talking with specialists and consultants and discussing cases together so that we may cover all aspects of your pet's treatment. Follow-up examinations and communication with you, our valued client, is the hallmark of our veterinary hospital. At Rhinebeck Animal Hospital, we use the latest veterinary technology, including radiology, ultrasound and a sophisticated in-house laboratory. Advanced technology results in better, faster treatment for your pet. That technology is backed up by a team of truly caring staff members and experienced, knowledgeable veterinarians who have one goal: the health and happiness of your pet. Rhinebeck Animal Hospital maintains the Rhinebeck Animal Hospital Helping Hands Fund, which is used to offset the costs that come with treating wild animals and for specific cases of financial need. We also sponsor fundraising events for local humane organizations and community events and projects. Rhinebeck Animal Hospital is proud to be an American Animal Hospital Association-accredited veterinary hospital. This distinction is achieved by fewer than 15% of the animal hospitals throughout the United States. What does this mean for you and your pet? To achieve AAHA certification, our hospital has passed rigorous, comprehensive inspections of our facility, management and medical equipment. We strive to meet and, when possible, exceed AAHA requirements. This means your pet receives the highest-quality veterinary care possible when he or she visits Rhinebeck Animal Hospital.